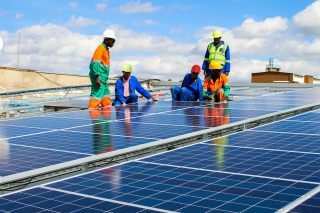 Telecommunications group, Econet Wireless has launched the first industrial solar plant in Zimbabwe. Situated at its Willowvale complex in Harare, this development proves to be a significant move towards clean and reliable energy for the company. With a capacity of 466 Kilowatts (KW), the plant will be operated under an Independent Power Producer (IPP) License for a period of 25 years. after which renewal is required. This means that the company will use energy generated only for its internal operations and at its base stations. “The commissioning of our Willowvale solar power plant demonstrates our focus to ensure that all our offices nationwide transition to clean and reliable energy as rapidly as possible,” Econet Wireless Zimbabwe CEO, Douglas Mboweni said at the launch. The solar plant has over a thousand panels, generating 780 Megawatts-hour (MWh) per annum. It was constructed and installed by Distributed Power Africa (DPA), an Econet company. The adoption of an alternative power solution – solar energy – by Econet is a huge step in the right direction for the private sector in Zimbabwe. It comes at a time when businesses in the country are being hampered by constant power cuts while the country is forced to import electricity from neighbouring countries. Reports suggest that Zimbabwe spends up to $5 million on electricity imports per week from South Africa’s Eskom and HCB from Mozambique. Thus, reliable and clean energy alternatives are the best options for companies to utilize. And although the country’s energy sector is liberalized, active private sector participation remains low due to capital challenges. The permanent secretary also expressed her belief that the Econet solar plant signals the beginning of the use of large scale solar in the commercial and industrial space. Meanwhile, Econet Wireless (a leading telecoms company in Zimbabwe) continues to spearhead private sector participation in the improvement of infrastructure and sustainable development in Zimbabwe. Earlier this year, the company launched an electrification project to help transform rural enterprises and create employment in the country. The electrification project also comes after Econet revealed its intention to invest $250 million in solar power systems in Zimbabwe last year through its subsidiary DPA. The company plans to create 5000 new jobs in the solar power industry once it is at full capacity and also provide solar energy for industrial, commercial and domestic use. “Our organisation launched a Green campaign in 2018 which has seen the company investing in alternative renewable energies starting with six of our own business premises … we are guided by our vision to harness alternative clean energy in the context of climate change,” Mboweni added.